Kaia's collection was borne out of a desire to fuse art and function. She wanted a chic, versatile alternative to the clumsy, embellished and heavy bags that crowded the market. Kaia seeks drama through simplicity and offers a pared down look that is subtle yet cleverly original. Designed with a free spirited, contemporary woman in mind, Kaia Peterka handbags transition smoothly from day to night, making it easy to be spontaneous and glamorous at the same time. All bags are spacious and extraordinarily lightweight, with most bags weighing less than two pounds. Day bags are sized to fit both work and play essentials, with room for a laptop, files and magazines while clutches have detachable shoulder straps to add versatility. 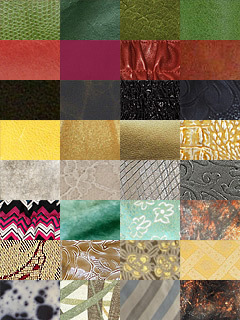 Kaia works primarily with Italian leathers, exotic skins and fabrics. Whether sublimely soft or uniquely textured, she chooses materials as much for their tactile appeal as for their look. Her signature brocade lining adds charm to every bag. The handbags are made, largely by hand, in the Chelsea neighborhood of New York City. Born in Oslo to a Norwegian mother and Czech father, Kaia inherited an adventurous spirit and insatiable wanderlust. Add to that her devotion to fashion and you’ll understand why her collection is coveted by so many girls on the move. She strikes the perfect balance between form and function with chic, artful styles that show personality without all the fuss. Art, culture and travel inspire the collections. She uses bold colors and unusual textures on minimalist shapes, resulting in modern and original collections that are dramatic, but not overdone. By pairing unique leathers, python and silks with streamlined designs, her statement pieces are versatile and life-friendly. Before launching her line, Kaia double majored at University of Virginia and also studied philosophy, painting and literature in Paris. During her time in France, she worked for a magazine, writing a social diary and reviewing art and dance. Kaia later honed her industry skills through roles in buying, sales, strategy and consulting while taking classes at FIT and Parsons in the evenings. To help prepare her to venture out on her own, Kaia earned an MBA with Honors at Columbia University. A collection for independent spirits who crave fashion without fuss. Chic, dramatic and simple, designs are luxurious and livable at the same time. Inspired by art and geometry, Kaia balances form and function for a modern vision of distinctive, streamlined beauty. Made in New York City, pieces are constructed by hand, using fine leathers, exotic skins and rich fabrics. Variations may exist due to the unique nature of the materials and the nuances of hand craftsmanship. With time and use, a product may mature and change as it develops its own story. We are committed to ethical trade and are opposed to exploitation in any area of our work. We seek to make a positive impact in the communities where we do business (and beyond) via philanthropy, local sourcing and environmentally conscious practices. ©2014 Kaia Peterka. All rights reserved.